KoopaTV: Baby, A Super Mario Odyssey Demo Encounter at Nintendo NY! Baby, A Super Mario Odyssey Demo Encounter at Nintendo NY! By SHINYGIRAFARIG - Nintendo NY Again. Ever since I had my child, it has been much harder for us to go out for leisure time. It’s not so simple to just take a baby and go out. You have to make sure the baby is well-fed to avoid having to have a crying baby while out in commute or to lessen the chance of her crying during inconvenient times. Nintendo NY was having an E3 week special where they had demos including the not-yet-released Super Mario Odyssey. I accumulated enough hours at work to not have to come on Friday of that week, so I thought it would be a great time to go there as it was a weekday. The children who would normally be at the store would still be in school, so there would not be as much of a crowd there, especially since we had to maneuver a stroller around. My husband has off Friday as well, since he works on Sunday instead. We fed the baby, and she was content and quiet. She likes to travel around in a stroller so that satisfied her too. We traveled to Nintendo NY and we walked around the store. I noticed the Splatoon plushies were back — last time we were there, they removed the plushies and only had Splatoon clothes there. They were obviously getting ready for the release of Splatoon 2. There were two Callies and two Inkling Girls before and I saw someone bought one of each and now there are one of each. You can see a part of the stroller here as well. Nintendo NY has an elevator so we used it to get to the second floor. While in the elevator, two other customers were on it and adored my child, saying that a goal in life for them is to have a family as well. My husband and I smiled, of course, as thanks for them saying that. We got off the elevator and saw the demo section. 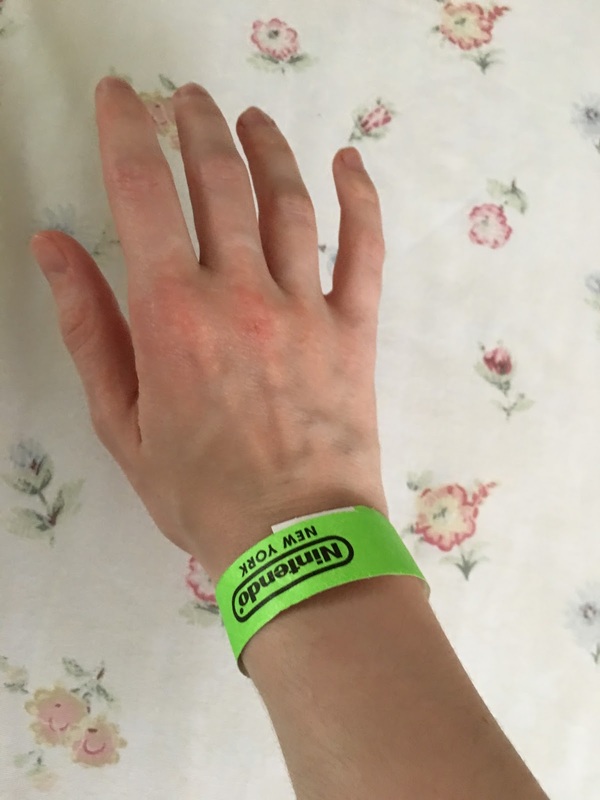 I asked an employee where the line is and they said they give bands for people to come back at a certain time and the next open slot was for 1:00 PM and we can line up for that slot a bit before that time. It was a bit before 12:00 PM so we agreed and got our bands. The baby did not get a band because she will not be able to handle a Switch controller as told to use by the employee. We then explored the rest of the second floor. I saw two Zelda shirts that I liked and did not know whether to get them then and there, or to wait until we were going to leave so we wouldn’t have to drag bags around unnecessarily. My husband thought to get them right away, so we did. There was barely a line to buy them. 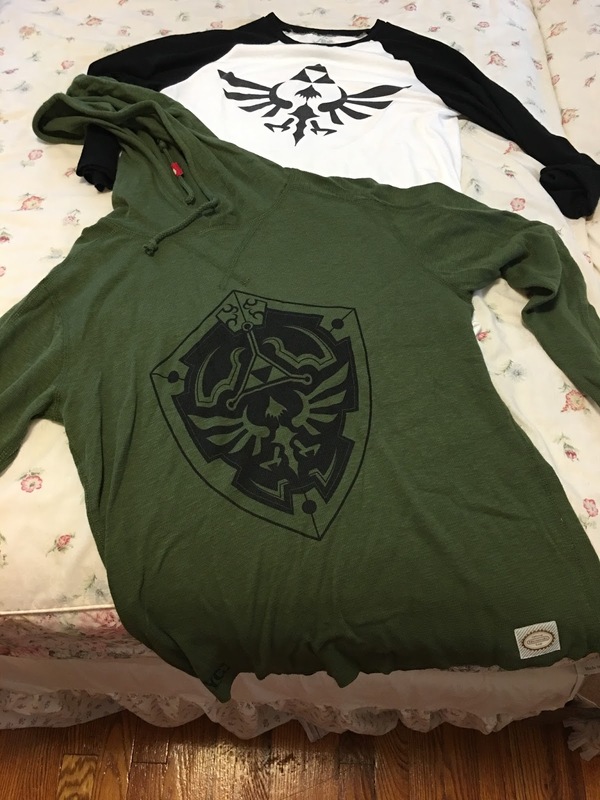 I will soon learn that it was a good idea to buy them as soon as possible as I wanted an ARMS sweatshirt as well, which was downstairs. We walked out of the Nintendo NY store and went to the Disney Store which was within walkable distance from Nintendo NY to see if we can put the baby in her Lil Judd costume. The Disney Store has restrooms to go to, including a changing table, while Nintendo NY does not have them. She was sleeping so we did not want to wake her. We rested there a little ourselves on the seats there, and then headed back to line up for our 1:00 PM slot. We got back and we were second in line, not that it mattered because when the time came a little kid cut the line when we were allowed to go to the demos. But before that eventful time, we watched others play the Super Mario Odyssey demo on separate booths, including one on the big screen and I told my husband about Pauline and the street sign references including about “Expresso” based on the ostrich from Donkey Kong Country. My baby slept during the wait so I did not put her costume even then. Our turn came to and the employees encouraged everyone to cheer, which woke my baby. Thanks a lot. 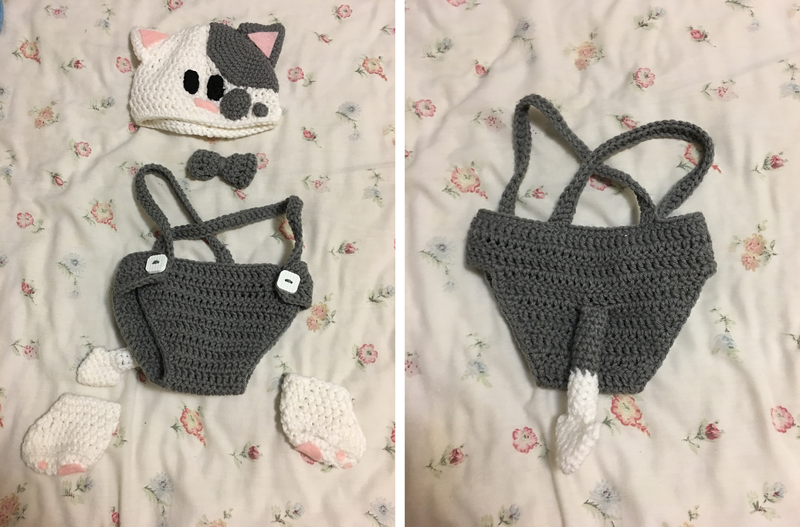 She was quiet and I did not want to make her cry so I never put the costume on her. I went to the first unoccupied demo booth and asked my husband which level I should play because I can only pick one for this session. He said to go for New Donk City which I then chose. It was a huge level. I ran through the streets, and there was a jump-rope minigame as you go through this city. I attempted to play jump-rope, but Mario jumps too high normally and I did not want to do the effort of making short hops when the demo is time-limited so I moved on past this minigame. I most likely will complete this challenge with the actual retail game. I saw a guitarist and spoke to him but he said some things I do not recall. I remembered seeing brief clips of getting musicians for Pauline on YouTube so I thought Pauline needed to be spoken to first. I went to Pauline and indeed that was the case. I got the musician near her and then the musician I saw earlier but each time I find a musician I get transported to the stage where they will all be playing with Pauline which annoyed me as it will make me lose track of where I was before. I was trying to look for a third musician and I got a hint from an NPC that they heard music above them but I had no idea where that musician was and I tried to find ways to get on top of a building but I was confused and the timer was ticking. I browsed aimlessly until I eventually got into a building, climbed upwards, met some Goombas and worm enemies that transform into mosquito enemies and then got out of that building and saw I had to climb a tower that resembled the Empire State Building. I climbed it up and got a moon collectable. No musician here. I then traveled a bit more in New Donk City and eventually the demo ended and I do not remember if I got another moon collectable meanwhile. It was my husband’s turn and he chose the other level that can be demoed, Desert Kingdom. He is not very experienced with platforming games, so I had to tell him in brief about the mechanics, including the capture mechanic. He was getting used to the possession mechanic and learned how to control a Bullet Bill, though it took a few tries until he got the hang of it. He then steered the Bullet Bill to a green moon collectable. He then went to the Mexican-inspired area and spoke to some NPCs which said that Mario needs to wear a hat that would resemble what the NPCs are wearing on their heads in the area. I suggested there is a store that he can go to in the game. My husband went near the store but found an area to crouch so he did and at the end of the area he was behind the employees who if you talk to them will say you need to be at the front of them. There was a moon collectable behind the counter so he got it. He then went to the store the proper way but only spoke to one of the employees and that employee did not sell the specifically needed headgear that would have Mario resemble what the other NPCs are wearing on their heads. I asked my husband to talk to the other employee but he went out of the store and then the demo ended. You have to pick your battles when you are married. 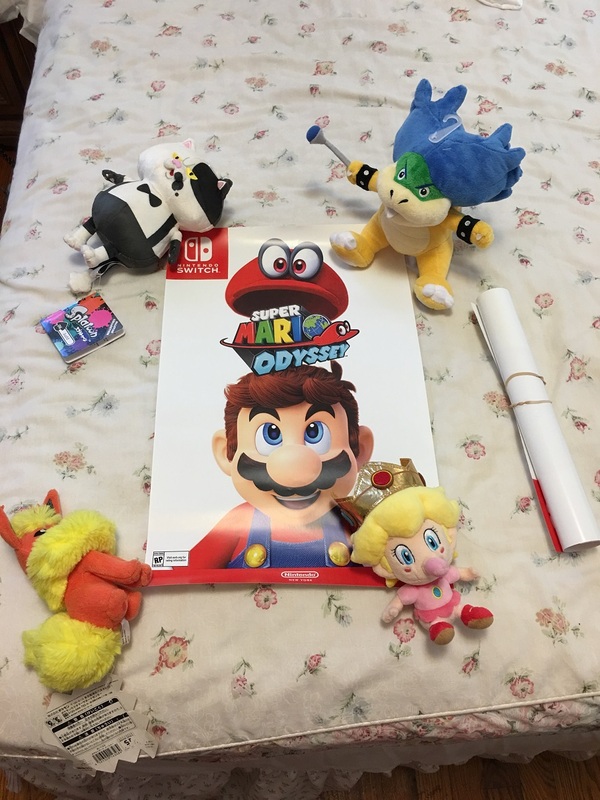 We each got a Super Mario Odyssey poster for playing the game making us have two to take home together. 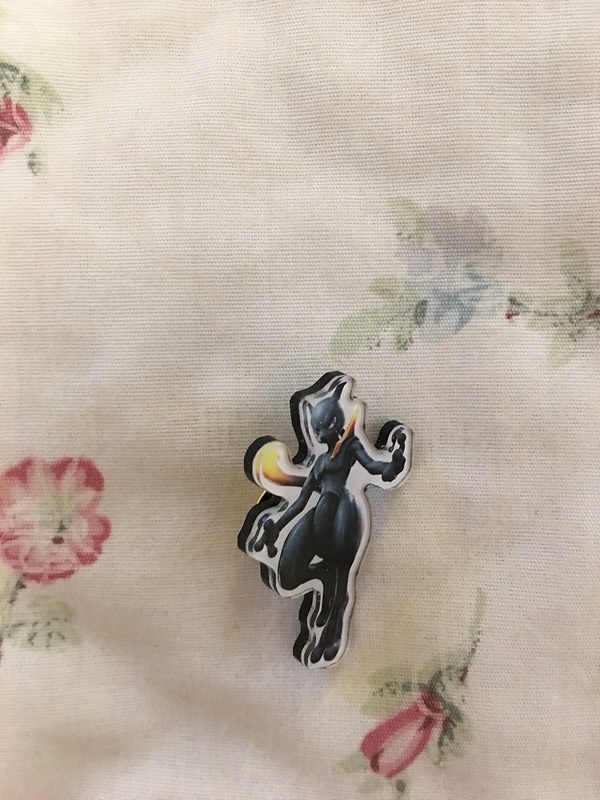 We then tried the Pokkén Tournament DX demo and got Mewtwo pins for it, then our baby got a bit agitated and we knew it was time to leave. I wanted to buy an ARMS sweatshirt but the line was extremely long. It is probably because more people are coming out from work so now they can shop as well. I was not willing to put up with a long line with a frustrated baby so I probably will get it next time. ShinyGirafarig can be found on Miiverse. ShinyGirafarig is excited to play a remake starting the birth of THE BABY again! See ShinyGirafarig's adventure when Nintendo NY had its grand reopening over a year ago! So, you liked the demo for Super Mario Odyssey? The game has now been released, so play the whole thing! Compare ShinyGirafarig's next documented Nintendo NY trip showcasing the Cappy-cahooting Nintendo Labo. One day, I hope that there will be Nintendo store locations in other major cities besides New York. I would definitely go frequently if there was one in Houston, for instance. According to what KoopaTV considers an untrustworthy site, PJ Sadler who is behind Nintendo NY, says there are no plans to open other Nintendo Stores as of this time. 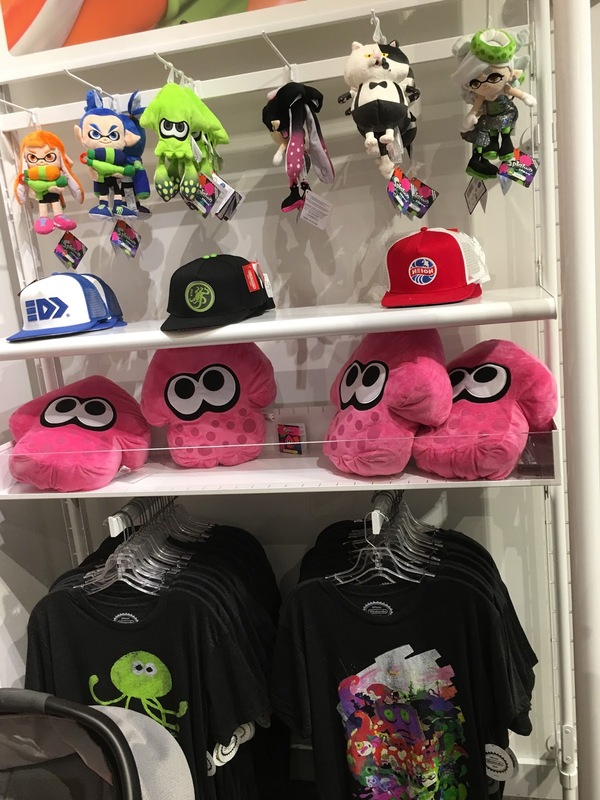 Even though I am at an location who can easily access Nintendo NY, there are store exclusive apparel and things like mugs that I wish was more easily obtained for people outside of NYC. I'd go to a Nintendo store if there was one in Nashville.